We have established this web site for communication between members of The Association of Unit Owners of Highlands Condominiums and to provide information to anyone interested in joining our community by buying or renting a condominium here. Please scroll down this page for a video and detailed information about our community. Welcome to our community! Highlands Condominium Association Members always aspire to be an inclusive community. It is the sincere desire of the Highlands Condominium Association that all residents have the opportunity to participate and share fully in the prosperity of our community regardless of race, religion, color, national origin, familial status, sexual orientation, gender identity, or disability. You are home! 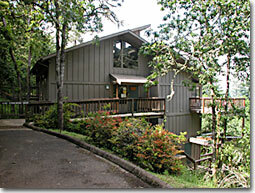 You have arrived at your Highlands Condo in one of the most beautiful settings in Eugene. It’s easy to feel that you’re living in a park surrounded by wooded hills. Deer graze in the generous open space areas around the buildings while native gray squirrels scamper through the limbs of the Fir and Oak trees. You may even see wild turkeys roaming the grounds. The Highlands Condominiums are located on the hillside above Willamette Street on the southern outskirts of Eugene not far the heart of the city. On your way home to your condo, you can stop to take advantage of some of the best shopping in the city including grocery stores like Market of Choice and Safeway, specialty stores like the Asian Market, wonderful restaurants, fashionable clothing and gift stores, pet supplies and essential services like the US Post Office, gas stations, and professional medical offices. After leaving your car in its designated, covered parking space, you will walk into your stylish, classic Northwest design condominium. The overall layout of the condo buildings speaks to the care that went into the planning and construction of the complex. The sixteen, eight unit buildings are situated for maximum privacy as well as maximum contact with nature. The front condo areas and/or the back or side decks bring you into close contact with the natural surroundings ensuring a taste of the countless and diverse trees and the songbirds that call them home. The view from the condo windows can be spectacular. Whether you are looking down toward city center or out towards the forest canopy in your own private tree house, you will experience a feeling of tranquility. Each condominium comes with one parking space under a carport. Approximately one quarter of the units also have garages and it is possible to purchase a garage separately from your condo if one is available. There are also several visitor parking spaces for each building. The design of the buildings enhances quality of life through its care and efficiency. The ends of the buildings have two, upper/lower single-story flats while the central four units are two-story townhouses. All units have two bedrooms. The flats have two bathrooms and the townhouses have one and a half bathrooms. The insulated walls and ceilings make for a quiet living space superior to most multi-residence living. Each building has a laundry room off its breezeway with two professional-grade, high efficiency, front loading washing machines and driers that are coin operated. Some condo units may have been retrofitted with an indoor set of washer and drier. Also located in the breezeway are the private, individualized mail boxes and the room for garbage disposal and recycling. The Highlands is committed to increasing its recycling to waste ratio and is in the process of having two large recycle containers for each building. Feeling like a little exercise? You’re in the right place. The Highlands has a beautiful, newly renovated Recreaction Center for the sole use of residents and guests. The Fitness Room provides state-of-the-art aerobic equipment, strength machines and free weights with adjoining changing rooms and saunas. Outside, there is a full length pool for summer swimming and a place to relax in the sun, alone or with your community of neighbors. Outdoor activities include hikes or runs on the Ridgeline Trail, one of Eugene’s finest trail systems that winds through the scenic wooded hills just above the Highlands grounds. Once on the trail, you can be on your way to the incredible vistas of nearby Spencer’s Butte, one of the Willamette Valley’s primary, natural attractions. Sitting on your deck in privacy and quiet or sharing it with friends or neighbors, the choice is yours in the tree canopy that surrounds all of the units at the Highlands. And, if you’re up for an evening out, concerts, theatre and restaurants are just up the road into the city, a mere ten minutes away. So near and yet so far relative to the peaceful, natural climate you call “home”. The Highlands Condominiums of Eugene, Oregon, offers the finest aspects of city living in a natural and tranquil setting. You may want to join us here, not only for the high quality living that you will enjoy but also for the long term value of the property that you will own as The Highlands is one of the best real estate buys in the Valley. Please come by and take a look around. We look forward to meeting you and, perhaps, calling you a neighbor. NOTE: Adobe PDF files are used on this website. Click the Adobe logo to get your free Acrobat Reader.